With some adjustments, your cat will go potty in the litter box. Suddenly finding cat poop on the floor might be Tommy's way of telling you that he's not a happy camper. Your finicky feline might dislike something about his litter box. Determine what this it and change it for the better, so he only uses the box to do his business. Bring your cat to a veterinarian to rule out medical conditions that might trigger him to poop outside his litter box. Discomfort from constipation or inflammatory bowel disease might trigger him to do his business in a more comfortable or convenient location. Bring a stool sample with you on your vet visit so it can be examined. Clean the litter box more often -- your cat might poop elsewhere because he refuses to use a dirty, smelly bathroom. Scoop out soiled litter at least twice a day and wash the litter box once a week. Dump out the litter, spray the box with a mixture of 1 part bleach and 10 parts water. Let it sit for 10 minutes before washing it with water and a mild detergent. After drying it, add litter. Change the litter box, because your pet companion might dislike it. Use a litter box that's at least one and a half times the length of your cat. If you're using an open box, switch to a covered box to give your cat more privacy. If you have an older cat, use a litter box with lower sides so it's easy to enter. Place the litter box in a different area of the house, because if it's near excessive noise, other pets or a lot of foot traffic, your cat might refuse to use it. Look for a quiet area that's easy to access, has an easy to clean floor and is away from your cat's food and water. Determine which kind of litter your cat likes, because the scent or texture of the litter you're using might have an adverse effect on your feline friend. To find out which litter your cat prefers, place three litter boxes next to each other and fill each one with a different type of litter. The one your cat does his business in is the one to start using. Provide your furry friend with a second litter box, because some cats are picky and don't want to poop and pee in the same box. Place the second litter box in the same room, but at a distance from the first litter box. Alternatively, place the second box in another room. If your home has multiple levels, place a litter box on each floor for easy access. 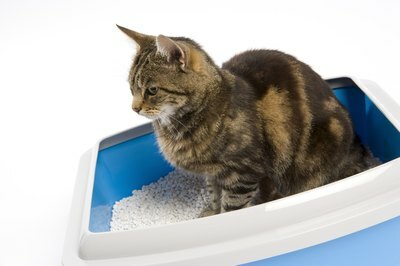 Refresh your cat's memory on how to use the litter box once you've figured out his preferences. Confine him to a separate room and place his new litter box with his preferred litter in the room so he can use it. Once he seems comfortable doing his business in the box, gradually give him more access to the rest of the house. What Is a Healthy Cat Litter to Use? What Is With the Cat Weight Limit for Petsafe Self Cleaning Litter?